Feasibility study on behalf of Crown Estate Scotland examined how coastal and island communities across Scotland could benefit from local offshore renewable energy solutions. Carried out by renewable consulancy Everoze, the study looked at six scenarios linked to a number of renewable technologies such as floating wind, wave, and tidal energy, aiming to provide a potential way forward to a more localized approach. According to Crown Estate Scotland, the study also analysed how the technologies could support the development of key industries, including whisky and salmon farming. Crown Estate Scotland is the public corporation of the Scottish Government responsible for the management of land and property in Scotland owned by the monarch in right of the Crown. For salmon farming, Crown Estate Scotland looked at a scenario where a site uses wave devices instead of diesel. Currently, wave energy cannot fully displace diesel due to the variable generation and large fluctuation between peak and minimum demand. Though, it is economically viable under high diesel cost scenarios to reduce the amount of diesel consumed through wave energy generation. Under the central diesel cost scenario, £1/litre, the modelled WaveCapEx would need to be £4.9m/MW before a 0.1 MW wave device is competitive with diesel generation. There is significant interest from salmon farmers for wave devices but the technology is still considered immature and aquaculture farms are often located in sheltered areas, away from significant wave resource. 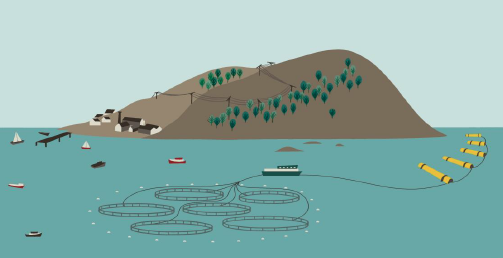 Have an option to connect the wave device to the fish farm and grid connections to the local island could potentially improve cohesion of demand and generation profiles, the study hypothised. The range of companies are actively developing this concept include both wave device developers and aquaculture companies, including InnovaSea, Wave Dragon, Resen Wave, Fusion Marine and Akva Group.